Sergei Gavrikov let us know on IRC channel #olimex that our board LPC-H2294 running eCos RTOS is working on small satelite Chibis-M for almost year. The satellite is developed in Space Research Institute of the Russian Academy of Science. The design goal was to make small but highly efficient spacecraft for detailed study of physical mechanisms of electric discharges (lightning) in the atmosphere is the widest energy range, from radio to gamma-ray emissions. They choosed to use as hardware Olimex’s LPC-H2294 development board running open source eCos RTOS on it. Now the satellite treactory can be seen in real time at http://chibis.cosmos.ru/trajectory , Chibi-M flying with 7.6 km/sec (approx 28 000 km/h) at 480 km orbit around the Earth. 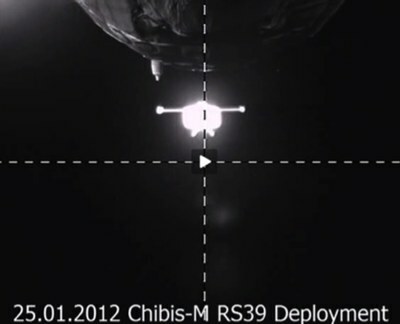 Here is another video (in Russian language) explaining Chibis-M features – it’s less 40 kg but have all features the big over 400kg satellites have http://www.youtube.com/watch?v=qRxgwV3UdlU, the name Chibis comes from small bird which lives in Russia. I am impressed with most things Olimex does as a company, but this is a real achievement. I have been reading quite a bit about the ‘Cubesat’ project recently as I wanted to write an article about the use of single board computers in amateur satellites, I thought you might be interested to know that companies involved in the industry are charging $25,000 for SBC’s with suitable spec. Maybe it is a growing market you should explore. Best wishes for 2013.